Today's Autumn mani is a base of Barielle Irish Eyes topped with New York Summer Lime Glitter. The leaves are water decals from Born Pretty Store. These decals are $2.46 USD for one sheet (I used 1/4 of the sheet for one mani). 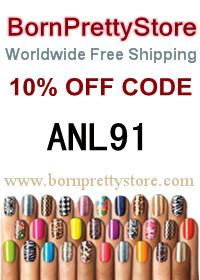 Plus 10% off regular priced items if you use my discount code ANL91.